Over the next year or so we are going to be looking at making a range of different drum sounds using an array of synths. Which will give you way more flexibility when programming your drums. 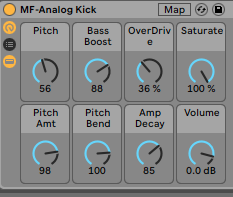 To start this blog series we are going to look at creating a subby kick drum with Ableton’s subtractive synth Analog. We can use this as the basis of our productions or as a layer. The choice is yours. Before building any sound, it is a good idea to have a list to some examples, we are aiming for a subby vibe, so having a listen to the 606 and 808 kicks will be a real help. Our aim is to not copy them but to use them as a guide. After having a listen to them, we hear a sine wave that sets the tone. There is a pitch bend on it to kick the classic kick punch and some overtones that could be some drive (distortion). And lastly, there is a little click. Now lets load in Analog on to a new midi track and get to work. Start by entering a note on each beat (using C3), I find doing this stops to the desire to make the kick to long and big. Which in isolation sounds epic and in the context of a track just does not work. Of course from this point, we will want to pitch the sine wave down. If you are not sure what note you want to use, load in the spectrum analyzer and pitch the octave and semi down until you have the root note of your track. For our kick, we have gone for G0 which is -2 on the octave and -6 on the semitone. At the moment its all sub and no punch, to add the much-needed punch set the pitch envelope to 55% and the decay to 33%. Now we are getting there, in the amp section, we can adapt to the decay time to decide how long the kick is playing for. And with all drum sounds its a good idea to have the sustain at its lowest value. The kick is set, now let's add some audio effects. To start add the EQ8 with a boost on the root note, this gives a little extra power. Next to add more body add the pedal on overdrive mode, set the gain to 67%, dry/wet to 30% and ensure the sub is on. Lastly, we add the saturator to get a little more out of the kick, set to analog clip, drive 3-4dB and set the soft clip on. As you can see by synthesising you kick drums you have a huge amount of control over each setting which can really help you adapt the sound perfectly into your productions. 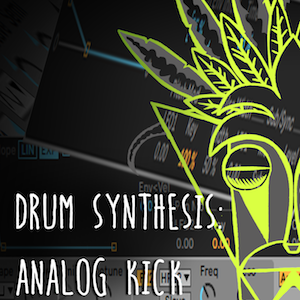 So stay tuned for the next in this drum synthesis series and don't forget to download the preset. And if you liked the kick in this blog post why not check out our Ableton Techno Presets Bundle.